The End of the American Exurbs and the Death of Sprawl? It’s a common refrain among Smart Growth advocates across the United States that goes something like this: “The fallout from the economic crisis is hitting far out suburban and exurban communities much harder than urban areas. This signals the end of unchecked suburban sprawl and a movement towards more sustainable, dense, transit-oriented communities.” It’s a refrain that, given my own interest in seeing the United States adopt a more compact, transit and climate friendly urban form, I’d like to repeat in confidence. Indeed, there are signs that our communities are becoming more compact. Even before the crisis Americans were shifting to smaller house lots and the country’s tolerance for expensive houses and long commutes appeared to be waning. Many urban cores were coming back to life with startling speed after years of neglect due to various demographic trends. Demand for Smart Growth communities was substantial and increasing. Then with the economic crisis, capital flows ceased and everything from suburban master-planned communities, to exurban mega-malls, to dense urban infill redevelopment came to a grinding halt, some even mid-construction. With something as complex and continent-wide as development patterns, we can’t just assume that today’s crisis translates into some fundamental shift in the way that we build our cities. It’s easiest for me to think of nationwide trends in urban centralization/decentralization in terms of the overriding factors and put aside the temporary economic crisis. Academic consensus and economic theory seems to point to income and transportation costs (commuting time and costs) as the fundamental drivers of how we distribute development. Thus in America’s postwar years, rapidly expanding incomes among the middle class combined with cheap automobiles, cheap gas, and newly completed segments of the Interstate Highway System led to a sustained and unprecedented period of suburbanization. That’s not to say that there weren’t other major factors of public policy and social reality that fueled the situation — just that income and transportation costs were the primary drivers. Housing and jobs moved far beyond the traditional urban centers to suburban tract housing and office parks near major roads, where before they were once constrained to locations accessible in walkable urban grids or by mass transit like streetcars. So what do the trends of income and transportation costs tell us about the post-great recession American urban development? Of course that will depend largely on how robust the recovery is, as well as how widespread its benefits are across the population. 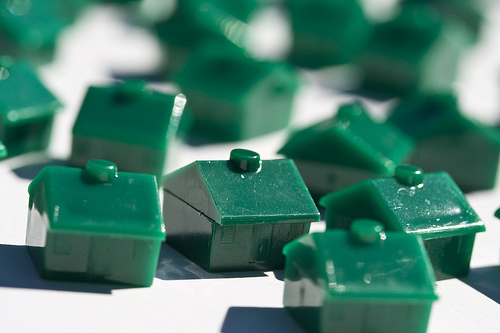 Rapidly increasing home values led to a frenzy of building, investing, and over-leveraging where people could use the equity they built in their homes as a blank check for further real estate investment. Granite countertops and stainless steel appliances, once reserved for the richest, became standard cul-de-sac fare. “McMansions” sprouted up everywhere, purchased in many cases by people would couldn’t afford them with mortgages they didn’t understand. Experts agree that these trends in large part contributed to the economic collapse, so we can only hope they won’t come back in force once the economy recovers. All signs seem to point to a less affluent, more frugal American consumer. The ULI report confirms that in the first graph below. You’ll notice that in the near-term, developers are most optimistic about housing types geared towards a decidedly less affluent consumer with multi-family rentals, mobile homes, and moderately priced single family homes rounding out the industry’s top three least dire housing products. On the transportation front, post-Great Recession American development patterns will also depend on how severely gas prices rebound to 2008 levels and perhaps higher. The impacts of rapidly rising gas prices could be largely offset by increases in fuel mileage efficiency proposed by the Obama administration. Maybe more significantly than the monetary price of transportation, development patterns will depend on how overburdened highways and transit systems are and how high land prices go. Cheap, accessible, develop-able land will still be a recipe for sprawl; that is, unless sprawl is stymied by local planning and zoning authorities. Transportation and relative land prices will be specific to individual metropolitan areas. Some will sprawl more, some less, but all of them will still sprawl quite substantially without concerted public policy. 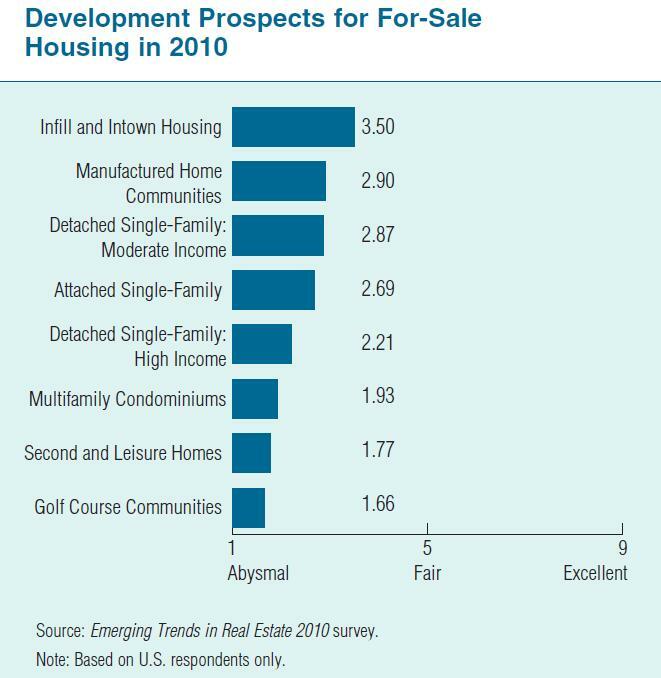 Development prospects for for-sale housing in 2010. 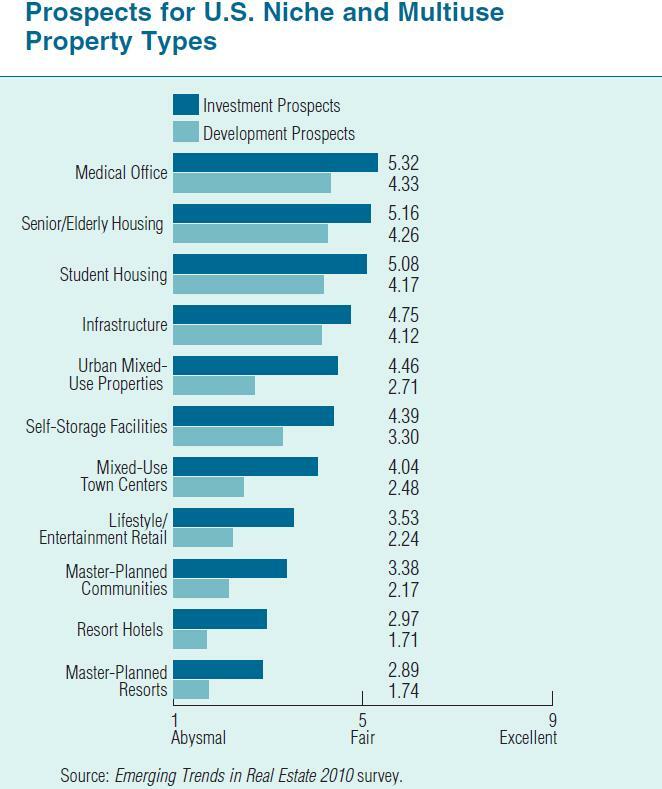 From ULI's Emerging Trends in Real Estate 2010 survey. Development prospects for for niche and mutli-use property types in 2010. From ULI's Emerging Trends in Real Estate 2010 survey.